We have been members of the Woodland Trust for a year now and are delighted to be working with The Woodland Trust again. The children love when their Nature Detectives Packs come through the door. Getting your very own mail as a child is very exciting and these packs are filled with woodland themed goodies. 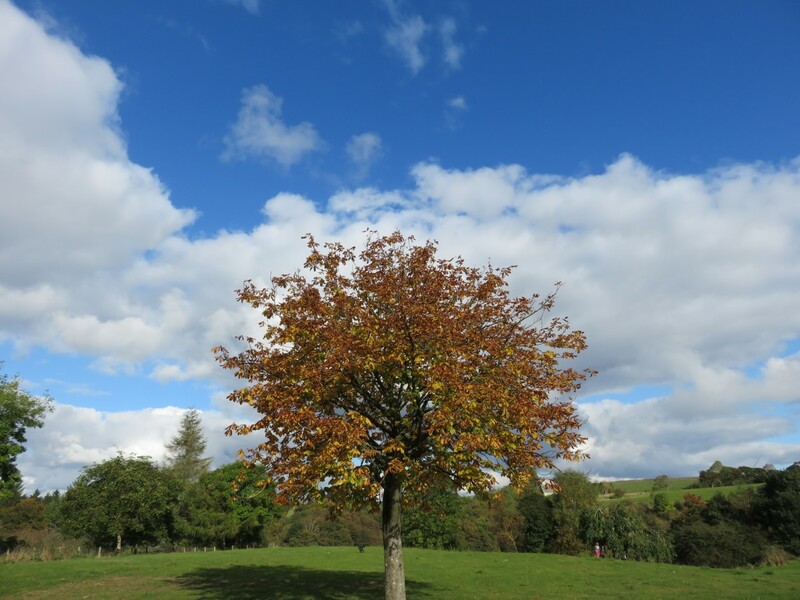 The Woodland Trust works tirelessly to raise awareness about woodlands so that they can help protecting woodland and the wildlife that lives there for generations to come by planting more trees. In the past 70 years, shockingly, more than half of our ancient woodland has been destroyed. We need The Woodland Trust more than ever! Becoming a family member of The Woodland Trust is easy just visit the Woodland Trust Website and take out a membership from as little as £5 per month. Your membership, allows you could help save woodland locally and nationally, protecting them for years to come. We also love the children’s membership which is the Nature Detectives and they will receive their very own welcome pack. 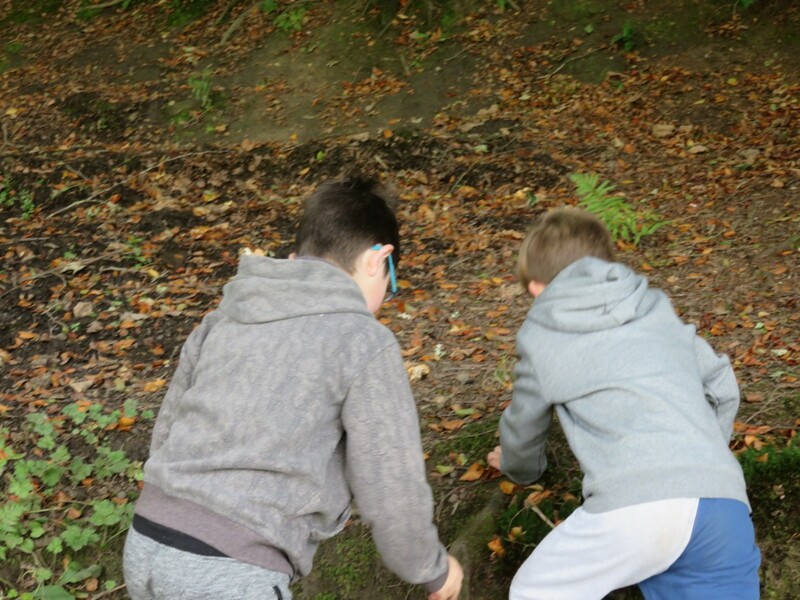 They get a little activity booklet filled with a range of things to try when outdoors in your wooded area, a passport and stickers for you to put on the pages are you complete different challenges. Our favourite They also received a leaf spotting book which is by far their favourite thing. The kids love getting their packs and their faces light up when the envelope comes through the door. 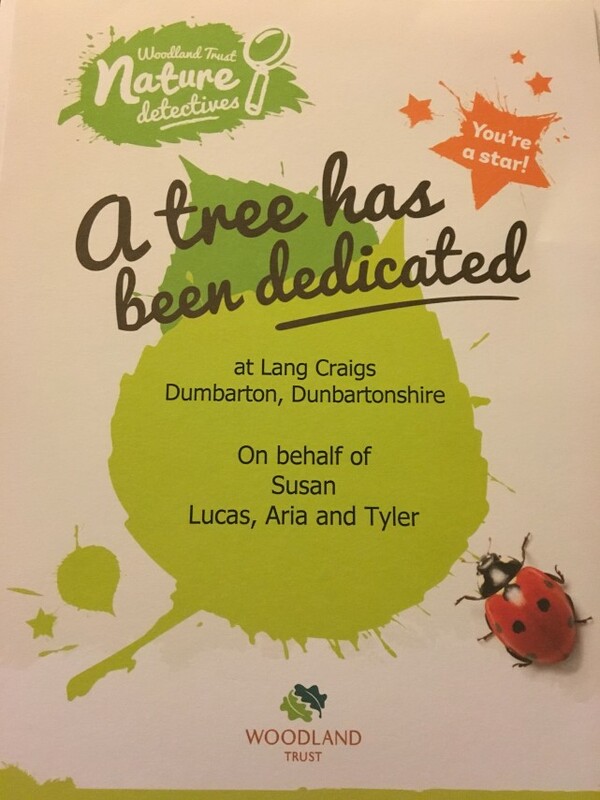 I personally love the tree dedication, I think it’s a lovely idea and we hope to go and visit our tree in the near future. It has details of where it is. 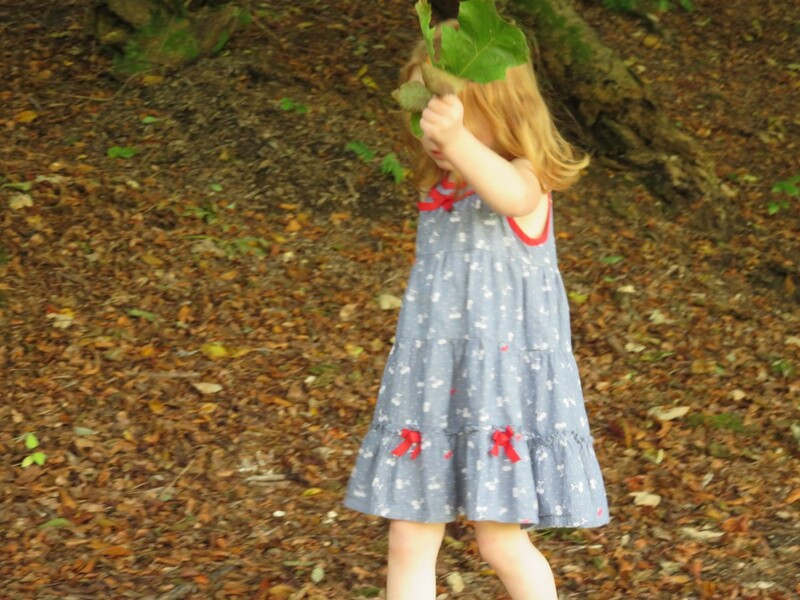 We couldn’t wait to get out and about with our leaf spotting book and headed to the woodland. 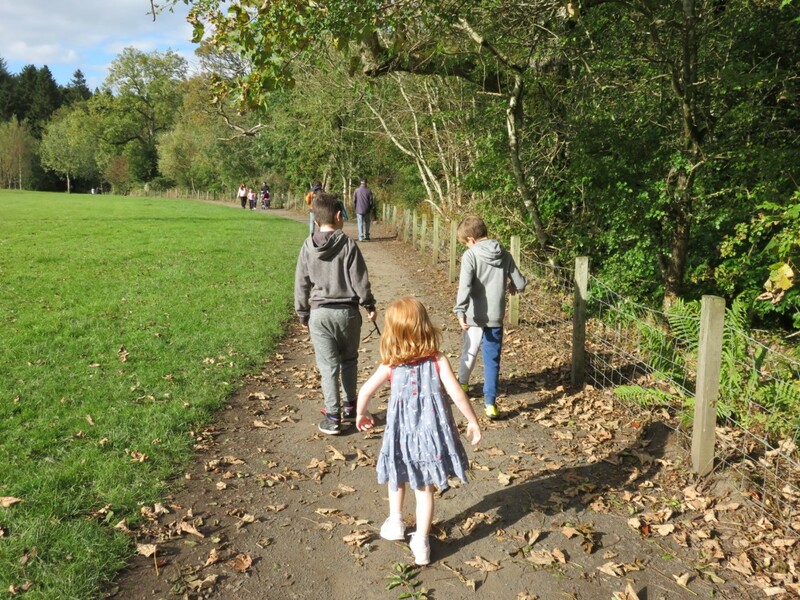 We set off on a beautiful autumn day to have some family time in the wood. First up, we went on a bear hunt. Thankfully, no big grizzlies were found on this occassion. But, we did look at the different leaves and searched for conkers on the way. 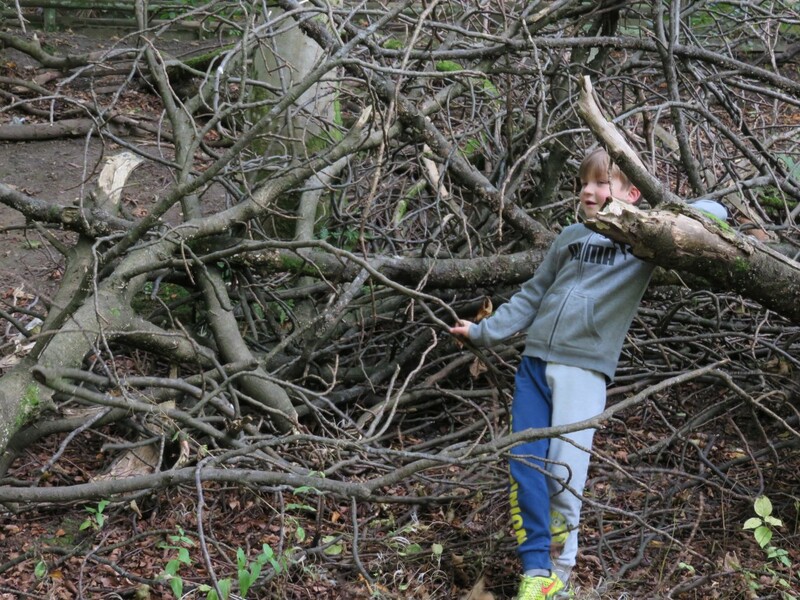 You can’t go into the woods and not climb some trees or build a den, can you? The boys had lots of fun trying to climb the trees, clamber over them and build a den in the tangled branches. It was a joy to watch and participate in. We had lots of fun in our wee den and just getting back to the simple things in nature. Look all around you, there is so much to see, do and discuss. Nature is just wonderful. Just look at that view? Relaxing, calming, just bliss. With the woodland trust, it really does encourage you to head out, have fun and enjoy the nature that is around us. Who doesn’t love that view? Clambering and searching for for bugs and ticking off our leaves in our leaf identifier. Getting down and muddy and not a screen in sight. This is childhood unplugged at it’s best. 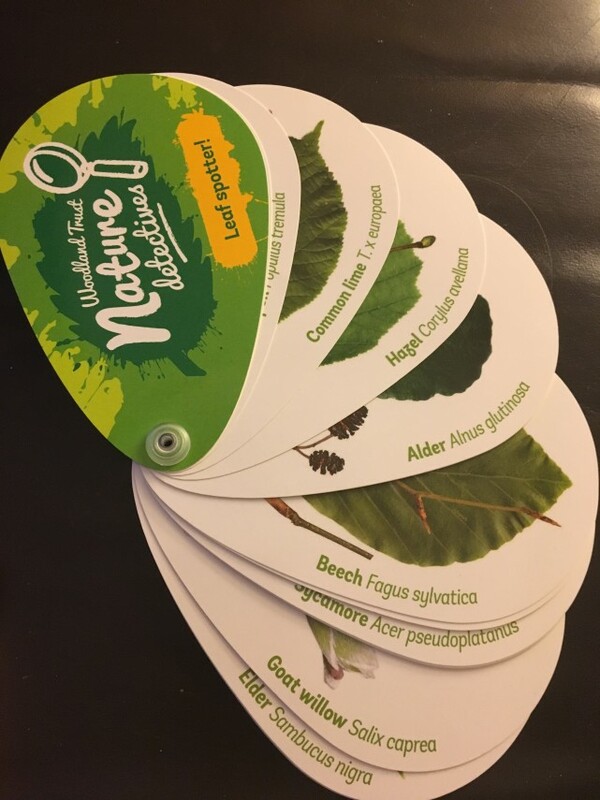 We found over 15 different types of leaves, or they may have cheated a little, but they loved it and found out so much more about the trees around them. We looked everywhere for conkers, but couldn’t find a single one. 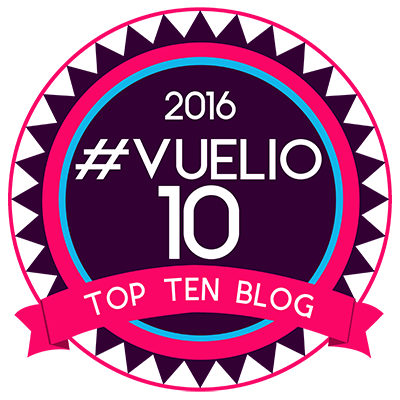 We’ve found none this year have you? Stomping over the troll bridge, “Who’s that trip trapping over my bridge?” We didn’t come across any trolls, but then we didn’t have any goats with us. Taking the risk no trolls would eat our toes, we collected some sticks and played pooh sticks in the fast moving water. Not sure who won, but we had fun watching them go. Don’t worry not trees were harmed in our game of pooh sticks, we found them on the ground. Be kind to our trees. Fungi are a another of nature’s wonders. I always picture them with fairies, I think from my flower fairies back in the 80s. They were one of my favouite toys. 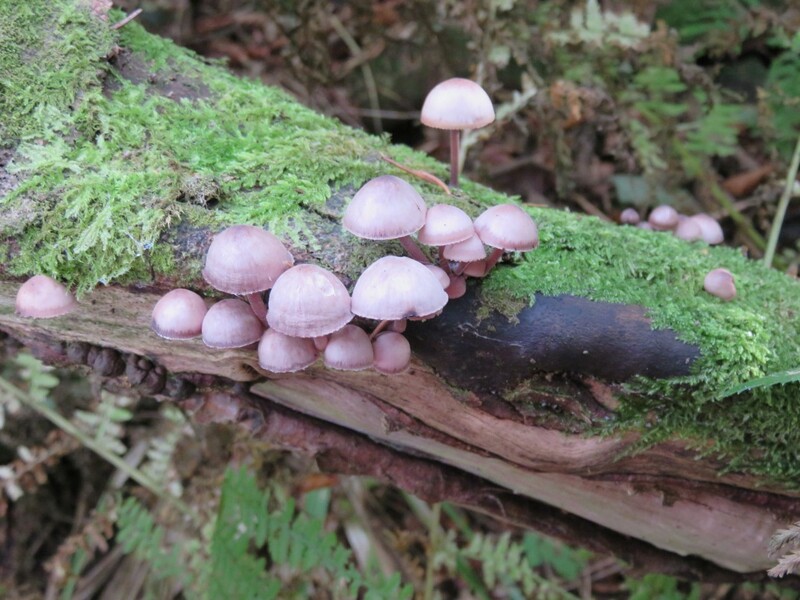 We had a look around for some fairies, but they must have been hiding this day. Lastly we collected leaves for our leaf crafts. We brought home a whole box full. You’ve got to love autumn and all the wonderful colours on the trees and on the woodland floor. It is pretty spectacular. I just love autumn, there is something cool and calming in the air. 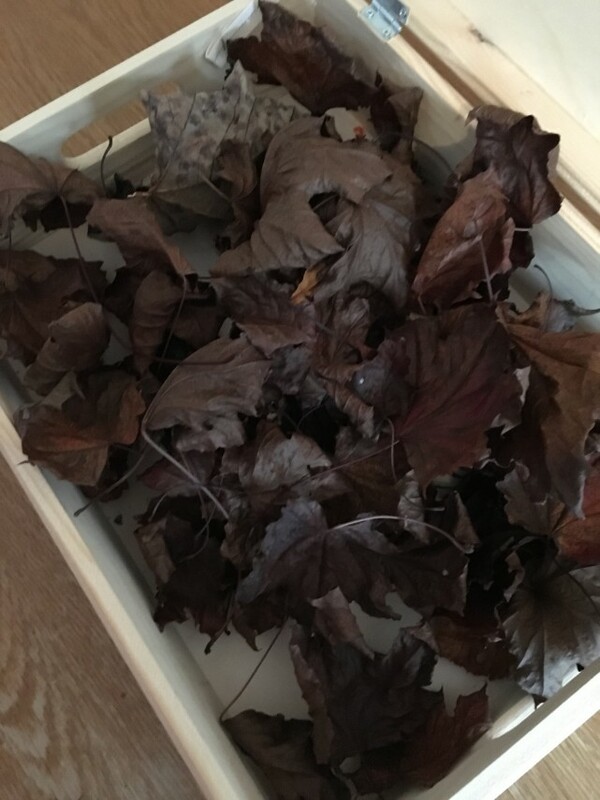 We let our box of leaves dry out for a bit so we could use them in our crafts of making a leaf hedgehog and owl. Aria and I got to work while the boys were at school. These are great crafts for toddlers to do. 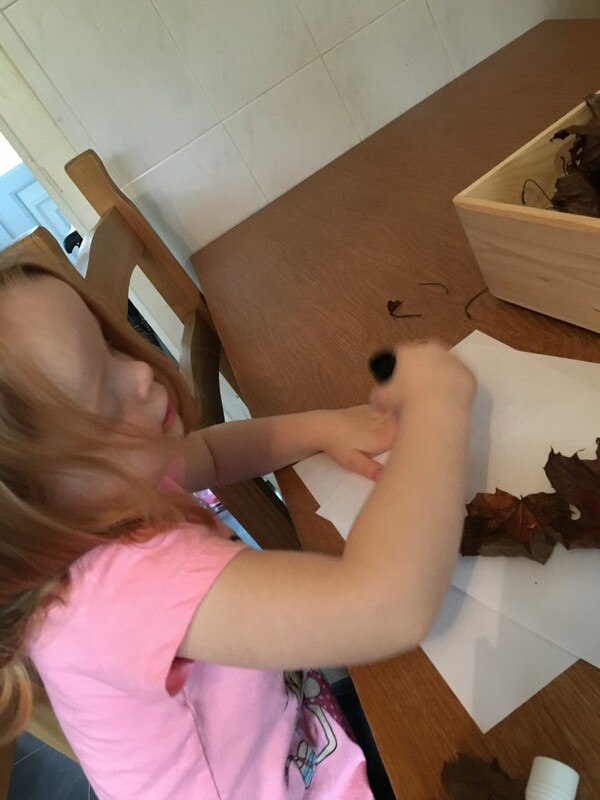 We got out some paper, a glue stick, pens and our leaves and set to work. For the hedgehog prickles we used out crunchy leaves. Sticking them down to the paper. We drew around the hedgehog and gave him a nice smiley face and cut him out. 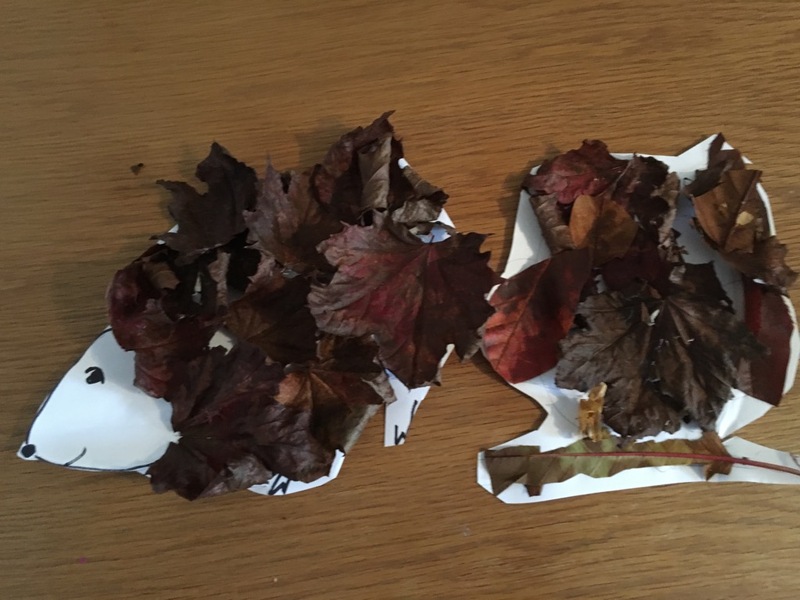 We also did similar to make a leaf owl, using different colour leaves for the different parts of the owl. We had a lot of fun making these and they were simple to do. Have you ever made a leaf picture? You can follow The Woodland Trust on the following channels; The Woodland Trust Facebook, The Woodland Trust Pinterest, The Woodland Trust Instagram and The Woodland Trust YouTube. I’d love to know your favourite woodland activity and what you think of ours? Disclaimer:- I have been given a family Woodland trust membership for the year. We love The Woodland Trust. what a really lovely post and the hedgehog idea is a fantastic one. We collected our leaves and are going to identify them at home. My eldest would love this. At three-years-old she is really getting into collecting the leaves, nuts and stones we find when we are out and about. We’ve even recently made natural art from her finds. What a lovely idea for a Christmas present! I love your video, the kids seem so happy out playing int he woods and the field and the river was running at quite a pace too. the woodland Trust is a great way to get out exploring and identifying leaves and as you say who can resist tree climbing along the way. There are so many natural distractions in nature that are a great way to develop creativity. 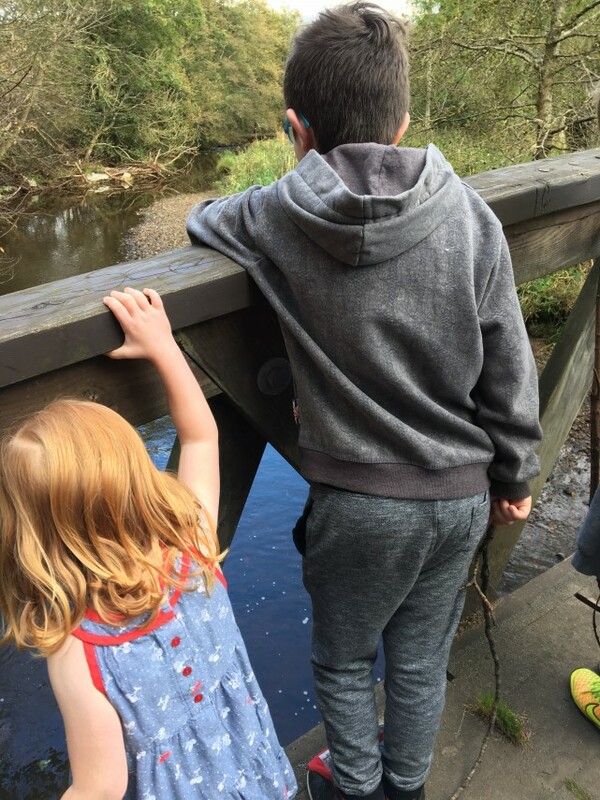 I love your leaf pictures, they are a staple for us here in our weekly crafts and pooh sticks too as we have a perfect bridge over a river just like the one in your video. I hope you continue to benefit from your membership. I love this! It’s right up our street and that fact about our woodland being destroyed is truly shocking. 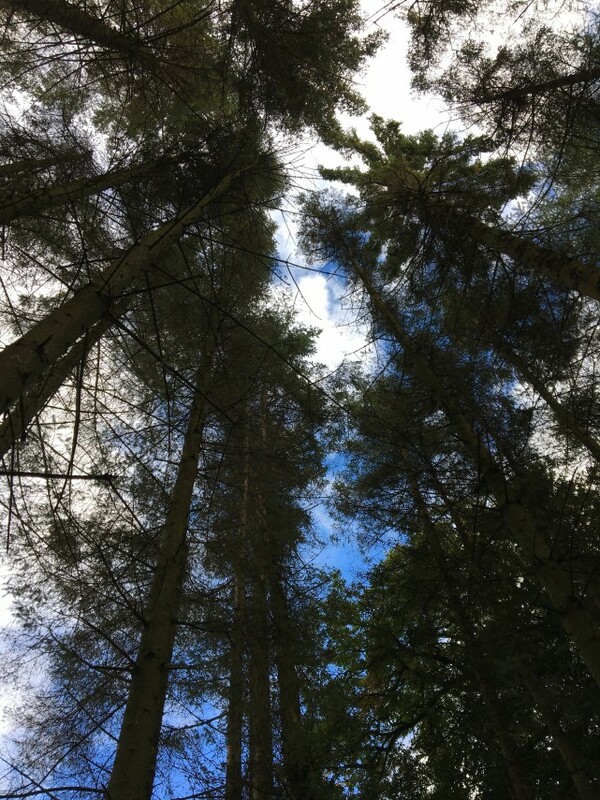 I love a walk in the woods, it makes me feel so grounded and relaxed. .
What a nice idea – love those craft ideas. Your photos are wonderful, and make me want to go out right now and enjoy our local woodlands. What a glorious adventure. We love a good walk in the woods too and like you say, there has to be some climbing. Ben just can’t help himself ! I have this pack and cannot wait to use it. I think I’d learn so much from it, never mind the kiddies 🙂 I love your photos, especially the little fungi! I love getting out in the local woods. There is always so much to see and do. Great photos and great idea too! I have been thinking about this for a while now. How lovely to be in short sleeves and summer dresses in Autumn – the weather really has been lovely this season hasn’t it? I wasn’t aware of all the added benefits you get from being a Woodland Trust member, and I do like the idea of a tree dedication and the little book that helps identify leaves. That really could come in handy! I love the photo looking up thru the trees, looking at the beautiful blue sky up above. It really was a lovely day for you and your family to be out walking. Aww what a lovely idea. I keep forgetting about the woodland trust and should look into it a bit more as it’s nice to do something different with the kids. The leaf hedgehogs are a brilliant idea, Harlow would love this.